It's Not About the Food – Page 3 – Living with a food addiction and succeeding. This blog is not about nutrition, diets, or the science of eating. It is about living with an eating addiction while losing weight and maintaining a desired weight and body size. With all of the diet workshops, surgeries, medications, supplements and diet foods the population is still increasingly overweight. There has not been anything presented to stop this trend. I decided to write because through the years I have tried all types of weight loss plans and gimmicks to lose weight and to keep it off. (You would be amazed at what I’ve tried). The only solution for me has been what I have learned through the years that I hope at least one person can relate to. I hope you will find it a passionate, positive, uplifting and even sometimes humorous account of a life dealing with weight issues from early childhood to adulthood. I hope you will understand what it is like to be called the “Campbell Soup Kid” as a child to catching a reflection on the side of a car as a adult and finally not seeing a “fat person” in that image. You might read the title of this blog and say to yourself…what do you mean “It’s Not About the Food?” It’s the food that goes into my mouth that has the calories, that packs on the pounds—it is clearly the food! I say that it is not about the food because I came to the realization that the actual taste of the food is so fleeting, are we really making our lives so miserable over just those fleeting moments of tasting food? How insane is that? Why? What is it about those fleeting moments that are so addicting? Is it more about the desire and allowing to give in to that desire as a reward or self pampering? The actual title was a spontaneous reaction to an advertisement for a nutrition/diet bar. I had heard that there was a diet book by Dr. Phil that gave steps on how to lose weight. At the time I heard about the book I thought “finally, someone who understands and will help us all to lose weight”. I felt this way because I respected Dr. Phil based on what I had seen on television and through articles he had written. Moreover, I felt that the reasons people ate were complex and it was so much more then sticking to a diet. Don’t most of us who overeat know what we should be eating and when to stop? I thought his book would be different. It would touch more upon the psychology of eating then calories of food. I was encouraged to get the book and to learn. However, prior to actually getting the book I came upon the print advertisement in Oprah magazine for nutrition bars that were developed and branded by Dr. Phil. I immediately shouted out – “No! You sold out! 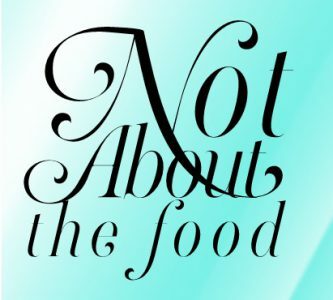 It’s Not About the Food”! Exasperated, I sighed and said “I should write a book” really not expecting to but responding to people just not getting it. What gives me the right to author a blog about losing weight and keeping it off? It has been my life. I realized that I have lived almost my entire life being addicted and obsessed with eating. I have tried countless diets with which most people are familiar but with minimal success, short-term success, no success at all, or demise. I have gone through each of the diets and understand why they did not work for me. Each week I hope to present a goal or thought that helps people and also share some of my struggles – both in the past and still today. Thank you for reading! Wishing you joy! When writing your story, start with the ending.